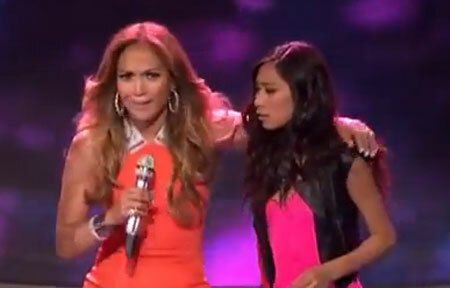 This is first time from the "American Idol" history, all AI judges saved Jessica Sanchez, the youngest finalist on the US TV singing contest from elimination last Thursday. Jennifer Lopez lead the way with her fellow judges Randy Jackson and Steven Tyler going to stage and announced that they will save Jessica without any doubt. Lopez said, "Give me that mic!," "This is crazy!" Jackson admonished audiences to vote more wisely and said, "we will saving Jessica without any doubt," "Let me just say this, for myself, Steven and Jennifer, this girl is one of the best singer in America, EVER! " He added, "please everybody, please vote for the best!" Jessica is the only "American Idol" finalist who have been saved by the judges from elimination in the entire AI history. Meanwhile, the winning contestant will receives a recording contract and this season's winner will be declare in May. Comments or suggestions about "Jessica Sanchez saved by "American Idol" judges" is important to us, you may share it by using the comment box below.